ARCS is club #288 in the American Model Yachting Association. Many of our members build, sail and race the Soling 1 Meter RC sailboat. 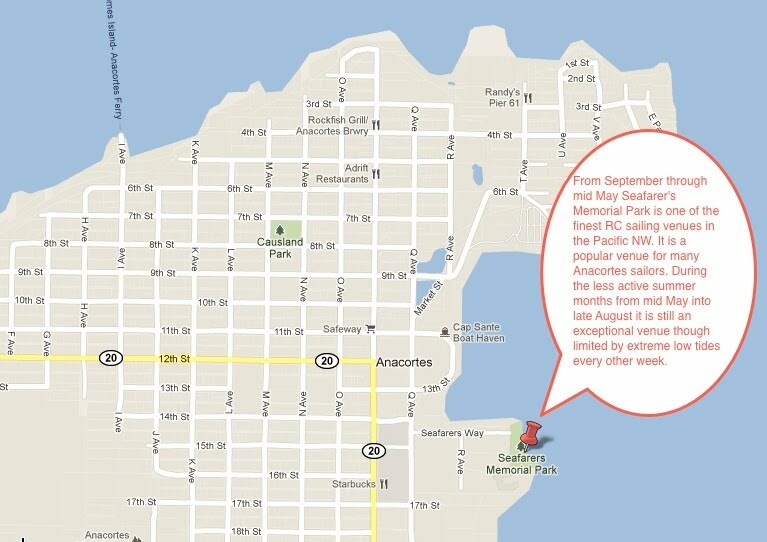 From September to mid May we meet every Saturday at 1PM at Seafarer's Memorial Park in Anacortes, WA for a couple of hours of friendly sailing and racing. Races are not scored and there are no trophies --- we race for fun and camaraderie. Non members and other RC sailboats are welcome. There are no fees or registration requirements, just show up with a boat. If you don't have one or would like to try RC sailing we can likely loan you one for a few races or to just sail around for awhile. If you wish to race we ask that all competitors know and observe at least the basic Racing Rules of Sailing. In keeping with the low key nature of our racing the rule regarding race marks is modified so that except when starting no penalty turn is required for hitting a mark of the course --- this may change if abused. Seafarer's Park reopened in May of 2011 after being closed for two years. During that time thirty four million dollars was spent to clean up a very polluted industrial site. It has an elevated pier and a long floating dock with fresh water available at the far end for boat wash downs. There is plenty of nearby parking and the restrooms and a shower are heated and clean. The venue is ideal for RC sailing because it is conveniently located in downtown Anacortes and favored year around with predictable winds from the SE through SW that are not influenced by nearby buildings or trees. It is well sheltered by two breakwaters. A dedicated chase boat/mark setting dinghy will be on site every Saturday (excepting major holidays and during extreme weather conditions) from September through May. Park access and ample parking is free. Panoramic view from North end of floating dock looking South and panning to the NW. Scroll to the right or left or just double click on the picture to take it all in. All pictures were taken on August 23, 2011 at a tide level of plus 7 feet. Higher tides up to 9 feet occur often. Below is another panoramic view looking West and panning to North. Minimum usable tide level for a competitive RC race course is about plus one foot and that is the minimum prediction from September thru mid May. Because of a decline in attendance in the summer and the occurence of extreme low tides every other week, racing on a bi-weekly basis during the summer months is subject to the enthusiasm of the local sailors and availability of a volunteer Race Director willing to launch the chase boat and set race marks. View from West end of elevated pier looking North and panning to the East. The sailing area is well protected by the large marina to the North and the two low rock breakwaters. A final panoramic view from the beach looking NE and panning to the South showing the large open area available for sailing and the two rock breakwaters.